Almost wordless: According to folklore, the Woolly Bear Caterpillar I saw this morning is predicting an average winter with a cold start and a mild finish. The wider the brown stripe, the milder the winter; the black indicates cold. I hope he’s right and it’s an average winter! I am in Minnesota, I dont know what average is 🙂 LOL I hope it means mild. Nice shot but I like the winter prediction better. Cute, but I wonder how accurate that prediction will be. Not accurate at all! 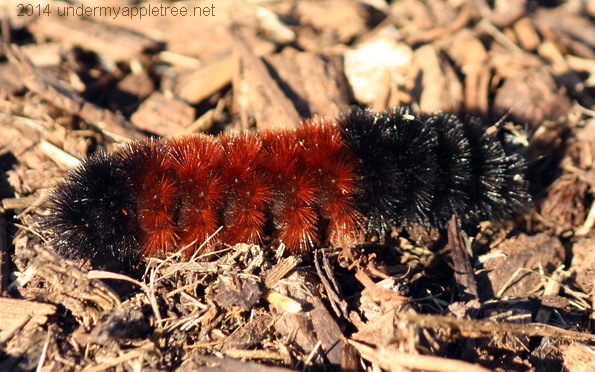 I saw another Woolly last week that had coloring for a mild winter. I like that one even better.